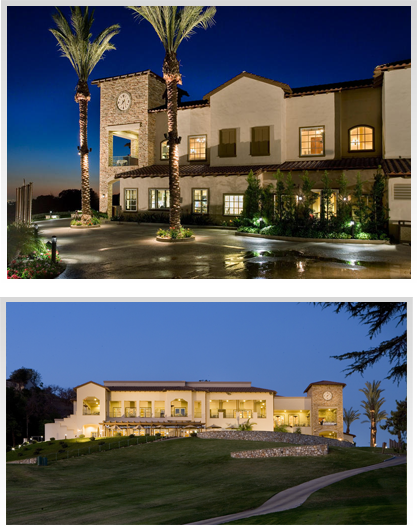 In 2006 the club celebrated the grand opening of our newly constructed multi-million dollar state-of-the-art clubhouse. Sitting on a quaint knoll overlooking the vast vitas and sweeping golf course views, our timeless Hacienda architecture blends naturally with the rural and tranquil setting in this luxurious and private community of La Habra Heights. Covered verandas for dining al fresco, prominent arches and viewing towers, private wine tasting room, executive board suite, banquet accommodations and other private dining opportunities are just the beginning of what our facility and setting offer our members and guests. During construction of our building, millions of addition dollars were invested in creating perfectly manicured grounds and complete renovation of our championship golf course. Come walk the grounds previously traversed by prominent titans of business and golf superstars, such as the one and only Tiger Woods who shot a Hacienda course record 62 in the SCGA championship!